The Reynolda Film Festival is intended as a celebration of film and filmmaking. It serves to inspire our community, and challenge the way that film education and the filmmaking process are viewed throughout North Carolina. We also hope it will serve as a resource for students considering a career in film. 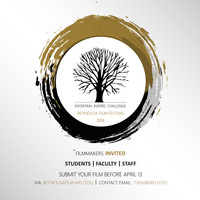 This year’s film festival will take place on April 21st, at 12:30PM on the 3rd floor of the School of Business at Wake Forest University. In celebration of our 11th annual Reynolda Film Festival, Nick Schrunk, Red Bull feature film documentary maker, will give a keynote speech detailing his film career and offer industry advice to students. After his keynote speech, there will be a panel with other film industry leaders where students will have the chance to ask additional questions. Then, the top film submissions will be screened, and Nick Schrunk will present the first, second, and third place winners, along with a prize for each top film submission.